Is your closet overflowing? You have clothes that no longer fit, accessories that you never use, shoes that would look great on someone else. You wish that someone could put these things to good use. But how do you get the clothes to the people who need them? It's not so easy to do it yourself. Local organizations that serve homeless and lower-income people are short on storage space and staff time. They'd like your donations, but sorting through them and giving the right clothes in the right sizes to the right people can be just too much. At Second Chances, we have the resources to collect, sort, and store apparel. Then we provide local homelessness, emergency assistance, and anti-poverty organizations with the clothing their clients need, when they need it. Learn more! Our "About Second Chances" video was created with help from our friends at Somerville Community Access Television (SCATV). How does Second Chances work? 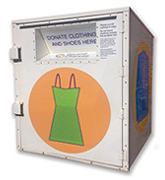 Local businesses and other property owners provide space for our clothing donation bins on their properties. 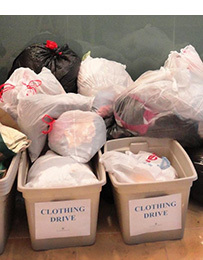 Local businesses, residents, congregations, civic organizations, and others coordinate clothing drives and accept clothing donations from their customers, members, and employees. Community members deposit their gently used or new clothing, shoes, and accessories in the donation bins or at a clothing drive. Second Chances sorts, organizes, and stores clothing, shoes, and accessories. Participating local organizations working with homeless and other low-income people in Cambridge and Somerville request specific types and sizes of clothing, shoes, accessories, and gift cards from Second Chances. Second Chances delivers clothing or gift cards to the organizations, and works with their staff to ensure that the infants, youth, and adults they serve have free, esteem-building, appropriate clothing so that they can take the next steps toward their goals. Some of your donated clothing goes directly to local organizations for their clients. What we're not able to use is sold wholesale so that Second Chances can purchase other supplies, like new socks and underwear, and support our program. Some donations are recycled to create things like car mats, carpet, and futon stuffing. Each year we provide free, empowering, clothing, shoes, accessories, and gift cards to hundreds of women, men, and children in our community while recycling and reusing nearly 200,000 pounds of clothing, shoes, accessories, and textiles. You do not know me but I wanted to thank you for the beautiful clothes I received through Second Chances! I was so excited about the clothing and when I looked through everything, I was absolutely amazed at all the wonderful things. I couldn't have done a better job picking things out myself! Everything I asked for and more was included and I am so thrilled to have such a wonderful wardrobe! I wish there were better words than thank you!" Beth C.